'Tis the season to be thankful and I am so thankful for each of YOU - my followers, fellow overachieving teachers, and blogging friends! I wanted to do something really special for the 1,000 milestone of this little blog of mine, so I'll be posting a new giveaway option each day this week! 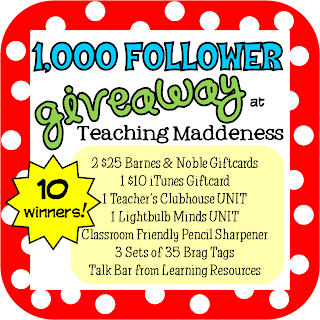 I'll be giving away some of my FAVORITE teaching resources and there are lots of ways to enter each of the giveaways, so I hope you'll drop by each day! For the first day, I'm giving away TWO $25 Barnes & Noble Giftcards. I mean, come on, the most favorite resource of every teacher has to be a GOOD BOOK! So, if you win, spend this to purchase a few new books for your classroom or treat yourself to a great read - the choice is yours! My all-time favorite children's book is The Tale of Despereaux by Kate DiCamillo. Absolutely LOVE it! Congrats on your 1,000 followers! The Giving Tree by far! The first book (besides Dr. Seuss) that I remember reading as a child!! There are a ton more that are worthy, but none that are as memorable. Congrats on your followers - that is amazing!! Mine also is a Kate DiCamillo....The Miraculous Journey of Edward Tulane. Congrats on all your followers! Seems like you were just starting not that long ago! Mine is Hooway for Wodney Wat. It's so so sweet. SOOOO hard to choose. I'm so in love with Leonardo the Terrible Monster by Mo Willems. Simple, yet so very profound. 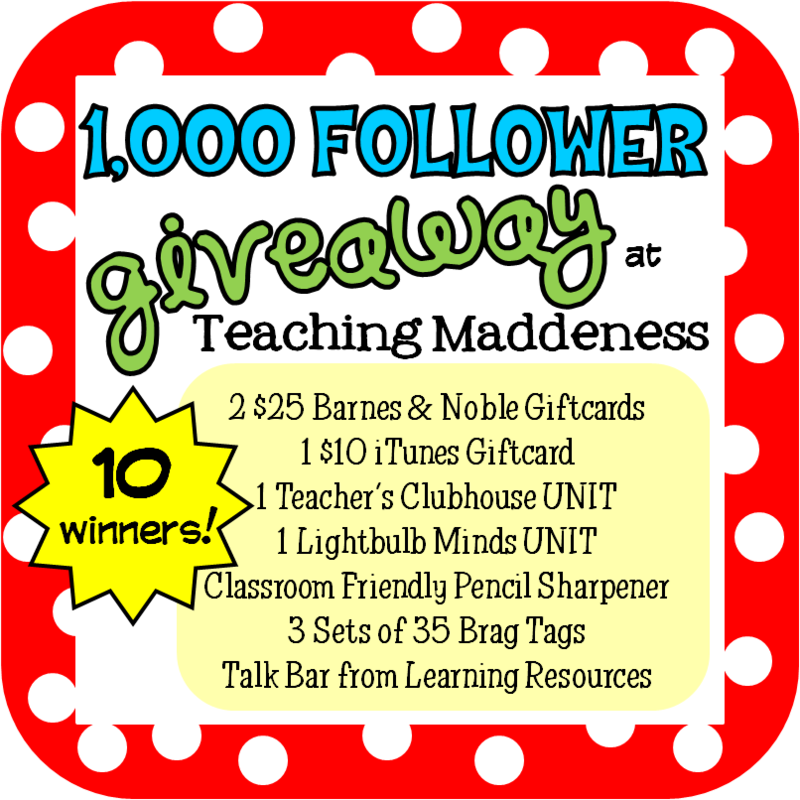 Growing Firsties is having a giveaway!! Frog and Toad. Love their little friendship. Congrats on 1,000! That's crazy! My favorite book (so hard to commit!) is The Twits. Anything by Dr. Seuss is awesome. As I child I loved Oh Say Can You Say. My favorite children's book would have to be Morse the Moose Goes to School. It's not very popular but just adorable! Oh, this is a hard one!! Today it's going to be Strega Nona. I love any Patricia Polacco books. My all time favorite book to read aloud is The BFG by Roald Dahl. I have been reading it aloud every year for probably 20 of the 27 years I am teaching. My all time favorite childrens book is Dr. Seuss ABC book. Both of my children LOVED it and I've read it to each of them about 100 times! My personal favorite that was read to me and I enjoy reading to my own kids is The Monster at the End of the Book. Love that book!!! that is tough, but it would have to be tikki tikki tembo...maybe! Such a hard decision...I'm going to have to say The Giving Tree ! I love the book "100 dresses". It is a great early chapter book. Oh I will always love The Giving Tree! There's a Monster at the End of This Book! I even bought the app for my iPad! So many good ones to choose from...but Ferdinand the Bull has to be my ALL time favorite! The Last of the Really Great Whangdoodles by Julie Andrews Edwards. I love reading it aloud using voices for all of the characters. I love when my students beg for me to read more. Congrats on 1000 followers! So many favorite books! Today, I'll go with Willy Wonka and the Chocolate Factory. I love, love, love The Miraculous Journey of Edward Tulane (Kate DiCamillo). The kids and I both cry every year! Any book by Kevin Henkes! Charlotte's Web is my all time fav! I have always loved reading aloud Ruby Holler by Sharon Creech! My favorite children's book is The Whingdingdilly by Bill Peet, I love that book! Congratulations!!!! I love your blog and look forward to reading more posts. I blogged about your giveaway. Check it out. Forgot my all time favorite children's book. Goodnight Moon was my absolute favorite book to read to my boys when they were little. I still love to look at their copy of the book. My favorite children's book was Goodnight Moon. Always a classic! Just one favorite book?! Eeek! I'm going to go with There's a Boy in the Girl's Bathroom. I started every year of teaching 4th grade with that read aloud! I love Skippyjon Jones. He is so much fun to read! Hard to choose... Charlotte's Web (lower grades) and Harry Potter (upper grades). I love a lot of books, but my favorite one to read aloud is Skippyjon Jones. I love Chyrsanthemum and so many others! As a child it was The Gingerbread Man. Now I don't think I could pick. Wow, that's hard. I love anything Kevin Henkes does. I'd have to throw out I Love You Stinky Face too because I adore reading that one to my kids! My favorite children's book? Too hard to choose, but right now I am going with Spoon. A simple story with a nice message about being happy with who you are. So many books, so little time. Love reading this blog! Love You Forever is a favorite. Right now I am reading Because of Winn Dixie to my class and lovin' it. Just found your blog. Thanks for the give-away. My favorite book is Peter Cottontail. My favorite classic - any Eric Carle book. My favorite right now - any Skippy John Jones book! Congrats on all the followers! My favorite books are the Skippy Jon Jones series. My favorite would be Winnie the Pooh. I don't know if I had a favorite but I love reading to my sons. I love Giraffes Can't Dance! Congratulations on 1000 followers! My favorite children's book is "Owl Moon". I love the illustrations and the words. Ilove reading my students The Hundred Dresses! Congrats on all of your lucky followers. My favorite book is any of the Boxcar Children books. They are great stories and very wholesome for our students. I have too many favorite books. I have a soft spot for Kevin Henkes, though. Love Owen. Congrats Amanda that s great! Harriet the Spy ~ This is the only book I remember from my childhood. I'm thinking it might have been my first chapter book that I read. I loved that book. I love reading Owl Babies to my kindergarten class...they cannot get enough of this book! My favorite Christmas book is Mr. Willoby's Christmas Tree! My favorite book that I read to my first graders this time of year is Olive, the Other Reindeer. My all time favorite book is It Looked Like Spilt Milk!! reading through all of your comments sure brings back lots of memories. My fav is A Nice Surprise for Father Rabbit. I don't think it's very well known, but my dad used to read it to me all the time when I was little. Definitely a family favorite! My favorite children's book is Where the Wild Things Are. I just love it! Congrats Amanda on reaching this amazing milestone. My all time favorite book is The Very Hungry Caterpillar. As a kid, Bridge to Terabithia, Wrinkle in Time. My favorite book growing up was the Nancy Drew series. Loved them! So many books to choose from, I'll go with Pinkalicious.